IPL Photofacials at Shizuka New York Day Spa use Intense Pulsed Light (IPL) to treat a variety of skin conditions, including hyperpigmentation (sun damage and age spots), rosacea and broken capillaries. 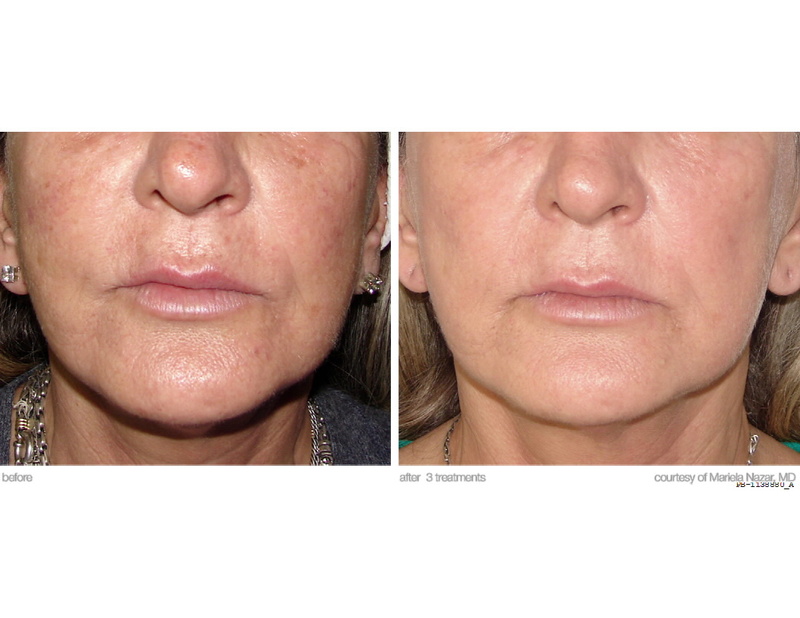 IPL treatment also stimulates collagen formation in the skin and tightens pores for a firmer, smoother skin texture. Please note that the IPL photofacials below do not include pore extraction; however, this can be added to your facial, depending on skin type, for an additional charge. Add GentleWaves® LED Facial Rejuvenation to your NYC photofacial to further stimulate collagen formation, tighten pores, and promote cellular renewal. Need help choosing a facial? Answer a few questions and get customized recommendations from Virtual Shizuka using FacialFinder Online Consultations. Voted Best Anti-Aging Facial in New York Magazine, this NYC photofacial includes cleansing with Shizuka’s naturals-based skin care products, IPL photofacial treatment, a firming collagen mask, and the application of hydrating and anti-aging products. IPL Spot Treatment is perfect for those who want to treat areas of the face and body for hyperpigmentation and broken capillaries. Individual results may vary. For more photographs, please visit the Lumenis Website. Discontinue sun tanning and the use of tanning beds and self-tanning creams 4 weeks before your NYC Photofacial at Shizuka New York Day Spa, and throughout the treatment course. This will reduce the chance of skin color changes, and development of new lesions. Always use an sunscreen with SPF 30 or greater on all exposed treatment areas and re-apply every 2 hours throughout the day. Wear protective, light-occluding hats and clothing. Discontinue use of exfoliating creams such as Retin-A and other skin exfoliating products 2 weeks prior to and during the entire treatment course. If you have a history of herpes outbreaks in the area of photofacial treatment you should consult your Primary Care Provider for medical evaluation and possible prophylaxis prior to treatment. An accurate diagnosis by a physician of brown spots prior to treatment is necessary before treatment of lesions. Be aware there is the possibility of coincidental hair loss when treating pigmented lesions in hair bearing areas. A mild sunburn-like sensation is expected after any NYC photofacial. This usually last 2 – 24 hours but can persist up to 72 hours. Mild swelling and/or redness may accompany this, which usually resolves in 2 – 3 days. Apply cool/ice compresses to treatment areas for 10 – 15 minutes every hour for the next 4 hours after your NYC photofacial, as needed, to reduce discomfort and heat sensation. An oral, non-steroidal anti-inflammatory, such as acetaminophen may be taken to reduce discomfort. Use according to the manufacturer’s recommendations. In some cases, prolonged redness or blistering may occur. An antibiotic ointment may be applied to the affected areas twice a day until healed. Bathe or shower as usual. Areas treated with IPL in our NYC spa may be temperature sensitive. Cool showers or baths will offer relief. Avoid aggressive scrubbing and the use of exfoliants, scrub brushes and loofah sponges until the treatment area has returned to its pre-treatment condition. The lesion may initially look raised and/or darker with a reddened perimeter. It will gradually turn darker over the next 24-48 hours, and may turn dark brown or even black. The lesion will progress to scabs/crusting and will start flaking off in 7-14 days. Do not pick, scratch or remove scabs. The broken capillaries may undergo immediate graying or blanching, or they may exhibit a slight purple or red coloring. Vessels will fully or partially fade in about 10 – 14 days. Do not pick, scratch or remove scabs. To schedule an IPL Photofacial appointment at Shizuka New York Day Spa, please use our online reqest form or call (212) 644-7400. Please keep in mind that all first-time photofacial clients require a consultation with owner, Shizuka Bernstein before treatment.